This is a follow-up to my previous post on Derrill Hart and will show how the story of this accomplished gentleman, a multi-sport athlete at the University University of Kentucky (UK), fits on this blog, though this and future posts will focus on his family instead of on him. Derrill Wason Hart was the son of former Confederate soldier Robert Singleton Hart and native-born Kentuckian Rebecca Wright Wason Hart. Robert was born January 9, 1843 in Montgomery, Alabama. He mustered into Company K of the 22nd Alabama Infantry (see also this link) as a fourth sergeant on October 6, 1861 in Notasulga, Alabama. Paperwork described him as an 18-year old farmer who stood 5 feet, 11 inches tall with a faint complexion, bluefish-gray eyes and brown hair. (A second form said he was a student.) He had enlisted "for the war." Bragg's Invasion of Ky. Blue represents U.S. Troops and red represents the C.S.A. After leaving Kentucky, the 22nd Alabama suffered heavy losses at the battle of Stone's River and then fought at Chickamauga and Missionary Ridge. The regiment fought during the Atlanta campaign at least at Ezra Church and Jonesboro. 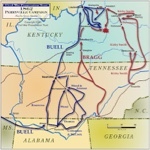 It then headed west to Tennessee under General John B. Hood and saw action at both Franklin and Nashville. 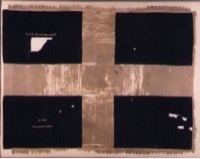 It ended the war in North Carolina, surrendering at Greensboro in late April 1865. Robert earned promotion to 1st sergeant in May of 1862 and transferred to Company E of the same regiment. Additional paperwork on fold3.com confirms he was later elected 2nd Lieutenant in that company in September 1862. According to this link, Robert was one of six brothers to fight for the Confederacy. It claims he was injured at Atlanta. Though the claim about injury was not correct, it was close. Two separate forms list him as "absent sick" near Lovejoy Station and "sick in the field near Atlanta" both on July 22,1864. (The forms were dated August and September of the same year.) They do not mention a specific illness or any injury. He also apparently went on furlough due to this illness and an order from the medical examining board at Montgomery. Pay records show he was earning $80 per month as a 2nd Lieutenant. A couple of documents from March 1863 show that Robert served as a staff officer in Major-General Jones Withers' Division, Lieutenant-General Leonidas Polk's Corps, in the Army of Tennessee, under the authority of Lieutenant-Colonel John Weedon. It reports no specifics of his duties, though one item in the file suggests he may have worked with the quartermaster's department. Another form under his name, dated August, 1863, has "a good officer" written on it. Less than a week after Robert was ill, his brother Benjamin (more on him in a future post) was killed in battle on July 28, 1864. This leads me to wonder about some of the more personal aspects of this time. How did Robert find out about his brother's death? Was he still in the field with the regiment, was he in the hospital or had he started his furlough? If he was still near the army when he found out, did he take the news back home with him? The medical board's order was from Montgomery, near where he lived, so he may have had the chance to deliver the news personally to the family. Was Robert still healthy enough to visit family? If he did go home, how mixed were the feelings there - happy to see him, but devastated about Benjamin? In what many call a "brother's war," this was one of many sad scenarios that occurred throughout the entire nation. Whatever the circumstances, it must have been a tough time for Robert, especially combined with his own illness. 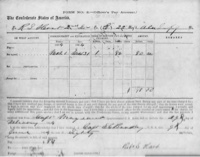 He did, however, return to his unit and apparently fought until the very end, as a "Parole of Prisoners of War" form is in his file, indicating his name was on a list of signatures dated April 27, 1865, near Greenville, Alabama. This indicates he had surrendered to (or been captured by) United States forces, probably cavalry, in the Military Division of West Mississippi. The 22nd Alabama had surrendered in North Carolina, so perhaps Robert was on some sort of detached assignment, though it is also possible he (and perhaps others) had become demoralized and deserted to try to return home, only to have the enemy catch up to them before they made it. For more information about Robert's life and family beyond the Civil War and a list of sources I used in researching these posts, see my upcoming entries.